Trump Watch #10. Click for more. Get your popcorn ready, folks! At 7am PDT / 10am EDT on Thursday 8 June 2017, it’s going to be a Shootout in the Swamp! @realDonaldTrump is getting ready to throw down, taking on James Comey and the Fake Main Stream Media (MSM) on the only court that really matters: the Twitterverse. 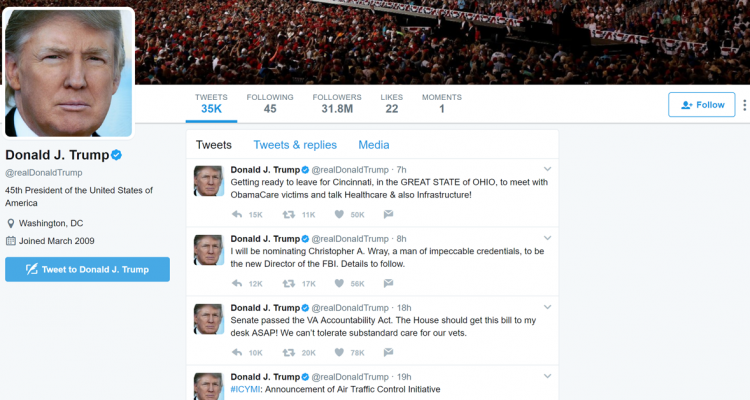 President Donald J. Trump’s Twitter account (the @real one, not the “politically correct” @POTUS) has long since become a national obsession. Even the people who hate him can’t turn away, caught by the irresistable mixture of rage and the kind of morbid horror and fascination one feels watching a slo-mo train wreck. It’s like reading the Darwin Awards, but only it’s the President of the United States peeing on the high-voltage wires. Trump knows that you can’t stop the signal. The voice of The Movement will be heard, giving the Real StoryTM straight to his people. POTUS45’s ability to shock may have suffered from the world developing a bit of a tolerance, but that hasn’t stopped him from pushing the boundaries of political behavior. We choose mockery. Because it’s the only way the Resistance is going to stay sane long enough to do anything about this wannabe autocracy. We took our Trump Cabinet Bingo card generator (modified from a project put out by the WNYC Data News Team) and filled the datset with some of Trump’s most significant Twitter ngrams (as tracked by the Trump Watch dashboard). We then supplemented that pool with a selected group that are particularly likely to show up in the context of the Comey testimony (intelligence, unmask*, real story, etc.). Blend together and, presto! Instant fun. Follow this link to generate your own randomly shuffled bingo card. Sample card below. Click to expand. The Disbeliever. Take a shot for every tweet that either makes you facepalm or headdesk. The Grammar Nazi. Take a shot for every typo. An additional one for every deleted tweet. The Echo Chamber. Take a shot for every RT from @realDonaldTrump during the testimony. The Cherry Picker. Take a shot for every time he quotes Comey out of context as evidence for something. Double-shot if Comey corrects him live on camera during the proceedings. Sure, the Comey testimony could completely exonerate the Presdient from any wrongdoing. Cleared of the Russia suspicions and with a freshly legitimized electoral victory, Trump could rally the GOP-controlled Congress and pump through massive tax overhaul, Trumpcare, and funding for tightened border security by the end of his first year in office. The new, stress-free President could make a calm, cogent legal argument (on or off Twitter) in favor of the necessity of extreme vetting that convinces 5 of the 9 SCOTUS judges to side with the government in State of Hawai’i, et al. v Trump. No Comments on "Let’s play Trump Twitter bingo!"